At the club's AGM on 7 March, Reg Battle was re-appointed as Club President. 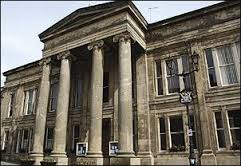 The Spring Ball will again be held in the Assembly Room in Macclesfield Town Hall, Market Place, Macclesfield, Cheshire, SK10 1EA. 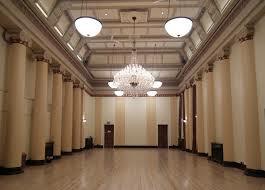 This will be another opportunity to dance in the 19th century Assembly Room which was refurbished in 2011. The ticket price includes a buffet supper and a licensed bar will be available. Car parking is available behind the Town Hall and is free after 6:00pm. Other car parks can be found nearby at Whalley Hayes, SK10 1BS (free after 3:00pm); Churchill Way, SK11 6AY; and Waters Green, SK11 6JZ (there is a steep climb from Waters Green to the Town Hall). Although this Ball is not advertised as a costume ball, it would be appreciated if dancers could dress in period costume or smart attire. The Adlington Folk Dance Club celebrated its 60th Anniversary over the weekend of 3rd - 4th October with a dance followed by a social event for current and past members. In addition a booklet containing reminiscences of me mbers, past and present, was produced. Nearly 100 dancers enjoyed the Saturday evening dance at the Tytherington School. 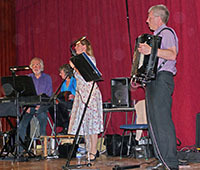 Music was provided by Kendal Green and Deo Volente – two bands, with two callers, Ian Jones and Victoria Yeomans, formed from a combination of only four people! Amongst the dances called were La Russe and Picking up Sticks which were known to be danced at the club around 1960. 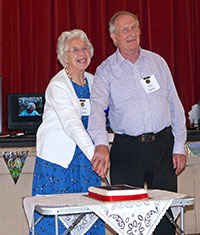 During the interval, Club Presidents Reg and Norma Battle cut a celebration cake. The following afternoon nearly 80 past and current members attended a social event at the Woodford Memorial Hall at which old acquaintances were renewed and current members were able to meet dancers from days past. Some original members from the W.I. section that started the club were present, about 10 members present had attended prior to 1960. Club Archivist, Joan Lowe, assisted by her husband Alan, had prepared an exhibition of photographs and documents from the club's archives which provoked considerable interest. A number of club members had provided laptops on which photographs of the club's 50th Anniversary and other social events were displayed. The Adlington Folk Dancers, the display section of the club, put on a display which was well received and the Adlington Morris Men, who began life as a section of the Club also gave a display. The afternoon concluded with a buffet, with food provided by current members. Many people contributed to the success of the weekend. It wouldn't be right to name individuals, but to the club's committee and members who planned the events, set up and cleared the halls, loaned computers, and provided the food on the Sunday, the caterer on the Saturday evening and the callers and bands; a BIG thank you. The final event in the club's celebrations was a meal and dance for current club members at the Legh Arms on 21 October. Nearly 50 members enjoyed a meal followed by an evening dance called by Rhodri Davies. The evening could have been spoilt by problems with the electricity supply, but the staff of the Legh Arms coped admirably in the cirumstances.